After a super quick and easy dinner? Of course you are! 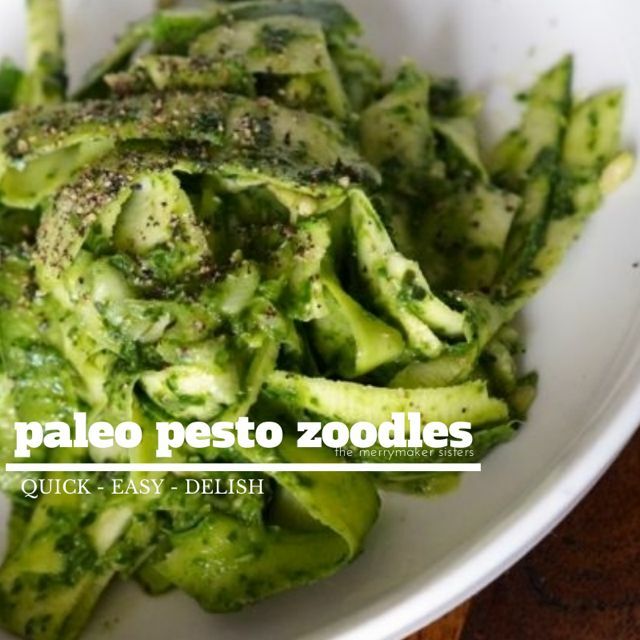 You really can’t go past our paleo pesto zoodles. The recipe is as simple as peeling or spiralisling your zucchinis, blending up a sauce and lightly frying it all together. We’re yet to invest in a super awesome fancy spiraliser and we seriously don’t know why we’ve taken so long to get one! They look pretty easy to use PLUS they make the most perfect zoodles… in fact it’s more like zuchetti! That’s it… we’re going shopping this weekend! Use this dish for Meat Free Monday or serve it as a side! How about you enjoy it with some savoury mince or your favourite pasta sauce?! Be sure to leave left overs because our paleo pesto zoodles are PERFECT for lunch (you can reheat or enjoy them cold as part of a salad!). ps. We just love to see your merrymaker recipe pics on social media and use #themerrymakersisters so we don’t miss it! Peel zucchinis lengthways until you reach the core (we just cut the core up and add it to the mix...we hate food wastage! ), you could also use a julienne peeler or spiralizer. 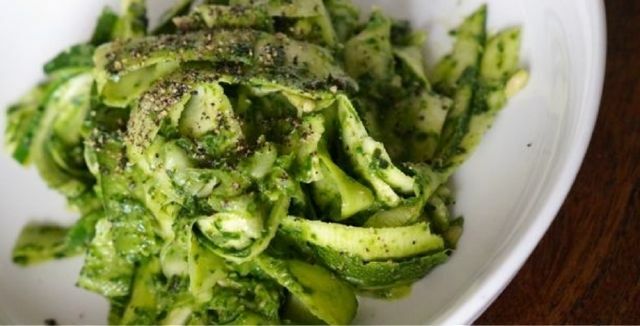 Place the peeled zucchinis (zoodles) in a bowl, leave this for now. In a food processor (we use our Vitamix) add the spinach, basil, avocado, lemon juice, olive oil, almond milk and pine nuts. Blend on medium speed until your preferred consistency (do you like it smooth or chunky?). In a large pan, add the coconut oil and the zoodles, cook for about 2 minutes. Add the pesto mix to the pan and stir well. That's it! We told you it was easy!